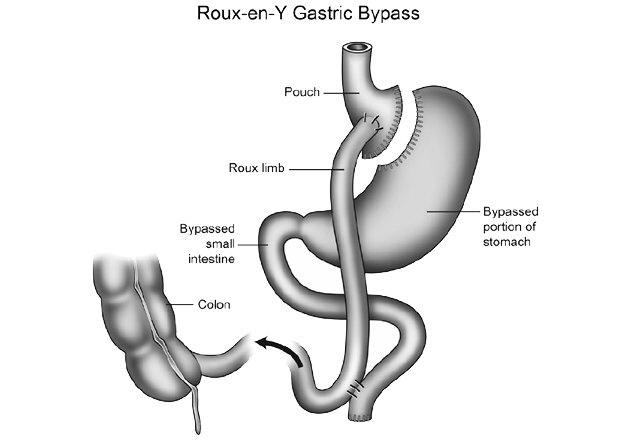 This is an operation where some of the stomach and part of the small intestines are bypassed. The stomach is stapled to leave a smaller pouch and then a section of the small intestine is attached (usually by staples) to the small stomach pouch that has been created. The procedure will change how and what you eat. You will not be able to eat as much as before because after this type of surgery, patients generally feel more satisfied after a meal and have less desire to eat. You may also absorb fewer nutrients and calories from your food as a result of the shortening of your small intestine. You may not tolerate foods containing fat, sugar, starch and sometimes milk, as well as you used to. If you eat too much of these types of foods you may actually start to feel ill, but this ‘side effect’ in itself could help you make dietary and lifestyle changes to achieve long term weight loss. This method of surgery is recommended for patients with a BMI (body mass index) of 40 – 55. On average, patients tend to lose 30% of their total body weight during treatment and 70% of excess weight (fat).